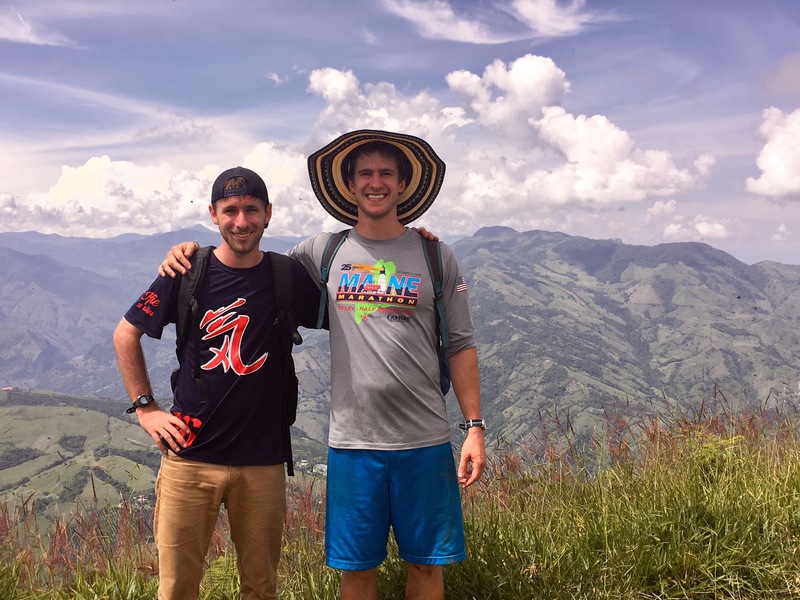 Growing up in Rye, Robby Kuster, a 2016 graduate of Davidson College, never imagined he?d be working in the coffee industry in South America and rooming with his friend, Taylor Love, a 2016 graduate of Bowdoin College. Both are immersed in challenging careers in a different culture filled with new experiences every day. The year after graduation, the pair, both armed with economics degrees, headed to Colombia to teach English. Yet when the program they enrolled in experienced delays, they looked for other work. Taylor landed a sales position with FAR International, a real estate company that raises capital, predominantly from U.S. investors to undertake real estate and sustainable agricultural projects. Taylor describes the company as a melting pot of talented and driven professionals from all over the globe. The firm had secured investors for a new coffee company, Abira. When Taylor happened to see the Abira directors at a caf?, he introduced Robby to them. The company needed help, and Robby fit the need. Abira grows, processes, and exports its own coffee but also sources other coffees from the surrounding region to fulfill clients? requests. ?Coffee is an incredibly complex product that touches many aspects of business as it moves from the farm to the cup,? Robby observed. His role ? business development associate/financial analyst ? is multi-faceted. One day, he?s building a new pricing model and another day, he?s providing English content for marketing materials. ?I?m getting to do a lot of what I wanted to do, but in another country,? said Robby, who doesn?t think he would have ever gotten a job like the one he? has in Colombia in his home country right out of college. Both Robby and Taylor have mastered Spanish, which Robby spends half his day speaking.? Although Robby didn?t study Spanish at Rye Middle School or The Masters School where he attended high school, he took classes in college and participated in an abroad program in Peru. To improve his skills, he read all the Harry Potter books in Spanish. ?Learning a language helps you feel closer to the people,? said Robby, who also believes that you use a different part of your brain in the process. Taylor, a Rye High School 2012 graduate, said he arrived in Colombia with ?zero? Spanish, but can attest that ?immersion works wonders.? They live in Medell?n, the second largest city in the country, which is set in the Aburra Valley surrounded by mountains. Although 20 or so years ago, Medell?n was considered the most dangerous city on earth ? think ?Narcos? on Netflix ? and plagued with drug lords and violent crimes, it has experienced a rebirth as one of the top cities in South America. Robby says it?s a fascinating place having undergone an extensive urban redevelopment. Taylor considers Colombia ?one of the world?s best-kept secrets? and loves the modern amenities, the warm and open people, the tranquil mountainsides, and the electric atmosphere of the salsa music scene.? ?The constant exposure to newness forces me to learn and grow swiftly.? And what could be better than living in the ?land of eternal spring?? Temperatures hover around 70 year-round, perfect for playing Ultimate, a passion of Robby?s since college and a popular sport in Colombia. He now enjoys league play with a new community of friends. Robby has also tried his hand at Tejas, a traditional Colombian throwing sport. Initially, he didn?t realize that the games go on day into night, typical of the more relaxed South American lifestyle. ?Colombians love chilling.? Due to the low cost of living, Robby, Taylor, and another American rent a spacious three-bedroom apartment with a balcony for around $850 a month, including utilities and Internet. ?The U.S. dollar goes a long way,? noted Taylor. Although Robby admits there are trade-offs ? his salary doesn?t allow him to save much money and he doesn?t see his friends ? he knows he will return to the U.S. a few years down the road with an invaluable experience.? ?This has been exciting for me to do as a young person. ?